Between Sisteron, Forcalquier and Digne, on the "Route Napoléon" (N85) or the l'A51 and the N96 then the D 951 (arriving from the North ) or the D101 (from the South). 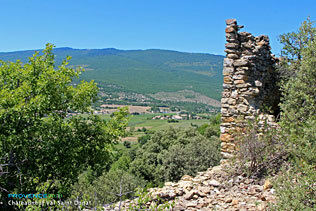 Châteauneuf Val Saint Donat is a very small village situated at the the foot of the Lure mountain, a few km as the crow flies from the river Durance and Château Arnoux. The village is located next to the former Royal Way which in times gone by took voyagers from Apt to Embrun. 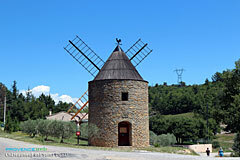 There are superb landscapes to be found in Châteauneuf Val Saint Donat wheat fields, olive tree orchards, lavender fields mix with wooded hills and vast green expanses. 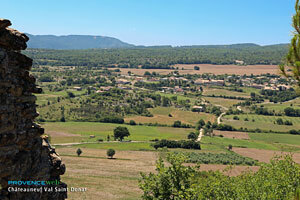 The landscapes around the village are very reminiscent of the Luberon and the area around Forcalquier. 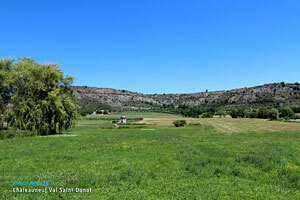 A small number of bories (shepherds stone built shelter built in the form of a beehive) and other shepherds dry stone shelters are scattered about the pleasant landscapes which are typical of the upper Haute Provence. This is nature, beautiful clear blue skies, no pollution, no noise, few automobiles, a simple natural environment which is respected. The best ways to experience the charm of the nature is on the long walks, on bicycle or on horseback. 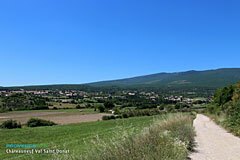 Close by the village from the ridges you can see Les Mées valley and its famous Pénitents, the Valensole plateau with its lavender fields as well as the Gap area. 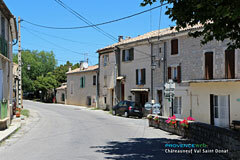 It seems that nothing can trouble the calm tranquility of Châteauneuf Val Saint Donat. 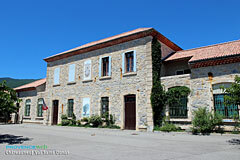 Although it is located away from the main routes it is nonetheless situated strategically in te heart of a triangle between Forcalquier in the South (20km), Sisteron in the North(12 km) and Digne to the East (27km). Walking and Hiking. Mountain Biking. Horse Riding. Aubignosc (5km), Château-Arnoux (9km), Les Mées (10km) et Volonne (11km).